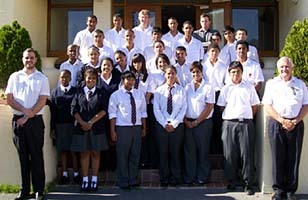 Aviation School - The Cape Academy of Maths, Science & Technology: Centre of Excellence! ... "Praestantia"
We, at The Cape Academy, want to give your child the chance to be part of the only Aviation training opportunity for scholars in South Africa. This, a first for the Western Cape, has become a reality at the Cape Academy of Mathematics, Science and Technology (CAMST) since January 2011. 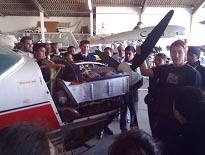 The Aviation School has been established to promote interest in Aviation and to expose the learners to as many Aviation-related career opportunities, e.g. pilot, engineer (mechanical-, civil-, aeronautical-), aeronautical medical practitioner, air traffic controller, mechanic, electrician or aircraft builder/ designer. The list of possibilities is endless. The high quality of training will be done by Cape Town Flying Club, in addition to the strong academic program, already offered by CAMST. The Private Pilot License (PPL) course gives the learner the opportunity to obtain a private pilot license, which is the first ladder to climb in aviation. The course for the Private Pilot License (PPL) is an accredited course at the Civil Aviation Authority (CAA) of South Africa. . This course will run over three (3) years from Grade 10 to Grade 12 and ongoing if needed (negotiable with Mr Sadar and the service provider). Learners must be South African citizens registered at the Cape academy. Learners have to have English, Mathematics and Physical Science. Learners have to pass 6 Aviation subjects for the academic qualifications. Learners must be 16 years old before they can write any of their official CAA examinations. Pass rate of 75% must be obtained for each of the 6 subjects. Learners have to do the 45 hours flying (5 hours of the 45 hours can be done in a flight simulator to cut costs of fuel. Learners have to obtain a grade 2 medical examination to commence with their grade 11 year subjects. (Optional MODELS are available for all grades – especially for grade 10 & 11 learners of 2015 who wish to start with this course in 2016) Negotiable with Mr Sadar and the service provider. Flying commences in grade 11 and continues in Grade 12 untill the required 45 hours is reached. Solo flying begins in Grade 12. Flying will take place from Cape Town International and other off base airfields. The possibility of doing some practical flying in a flight simulator (Approved by CAA). 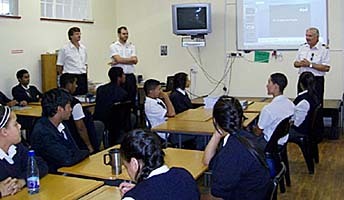 Classes at The Cape Academy of MST – media room, computer laboratories, flight simulator. If learners succeed in the 4 subjects in grade 10 and want to proceed in Grade 11, a medical examination must be done to comply with CAA regulations. The costs and organization of this examination are the sole responsibility of the student and not the school or the training company. Practical flying (plane, instructor and fuel) – pay as you fly @ R1350 per hour. Total cost for PPL course: R64 850 + first flight (abini) in gr10 (Optional of a cost of R1210. Costs will be reduced for all of the enrolled learners if sponsors are found to assist this program financially. Economically challenged learner(s) will receive sponsorship as far as the budget allows the program organizers to assist the learner(s). The CAMST will work towards the accreditation of the subjects taken for the PPL at the South African Qualifications Authority (SAQA). This means that learners will get credit for prior learning which will stand them in good stead once they enter the job market in Aviation.